The Logo you see has defined GREATNESS in women basketball! The Woman you see defines PURPOSE. What could I possibly write about Pat Summit, or this great basketball empire she has built from the ground up, that has not already been said? Probably nothing, but I will in my own words let you guys in on this upcoming season. We already know the Tennessee Pride that exudes from Pat's veins, but what is extraordinary about her, is her ability to make it exude from others. Pat is able to do this because she knows her purpose in life: To teach, encourage, uplift, inspire, and cause those to believe, who may have given up hope before they met her. The vein God has given her to do this is through basketball. There truly are only a handful who have been "called" to this type of platform in the women game(C. Vivian Stringer, Van Chancellor, Andy Landers, uuuhh umm Geno Auriemma). Now as a player when you have Pat Summit knocking down your door, or blowing your phone up, rest assured you have something special, and she is more than willing to help you get it out...lol. 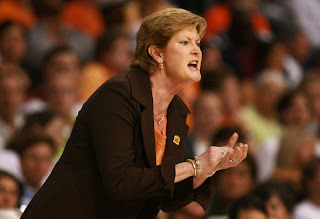 She doesn't recruit players she feels she can't teach anything, or develop for the next level. The woman looks at your life as a whole and see's if she has what it takes to help you reach your goals...to prove it 100% graduation record. So having the #1 recruiting class last year reminded me of the 2004 class of Candace Parker, Alexis Hornbuckle, Sade Wiley-Gatewood, Alex Fuller, Sybil Dosty, and Nicky Anosike. So the bar was set high for this team...people called them "the babyvols" but do you ever have time to be a "baby" when you don the Orange? Probably not? We are so spoiled. Well we know how that class started-Candace Parker had knee surgery and sat out the entire season, SWG was also injured most of that season...and it was an elite 8 exit. The next season, Parker was back but SWG transferred, Hornbuckle forced to play the point-broke her hand=elite 8 exit! It was that same "look" I spoke of when introducing Kelly Cain that Parker had when the season ended. The team came together on its own...no talk from the coaches, but they had a team meeting and decided they would hold each other accountable on the court and off. It was time to bring the championship back to Knoxville. They did just that..not one but two! 2009-2010 LadyVols showed us resiliency when they played Rutgers, coming back from a 20pt halftime deficit. After the disappointment, (the wins come with every unforced practice of your game) comes the glory. You all know what it's like to be the first UT team to lose in the 1st rd of the NCAA tourney, now be the first UT team to win a championship the next year. Just like that 2004 class, you are still the #1 recruited class for your year...put the work in, and the country will see it! It's the RETURN TO GREATNESS!